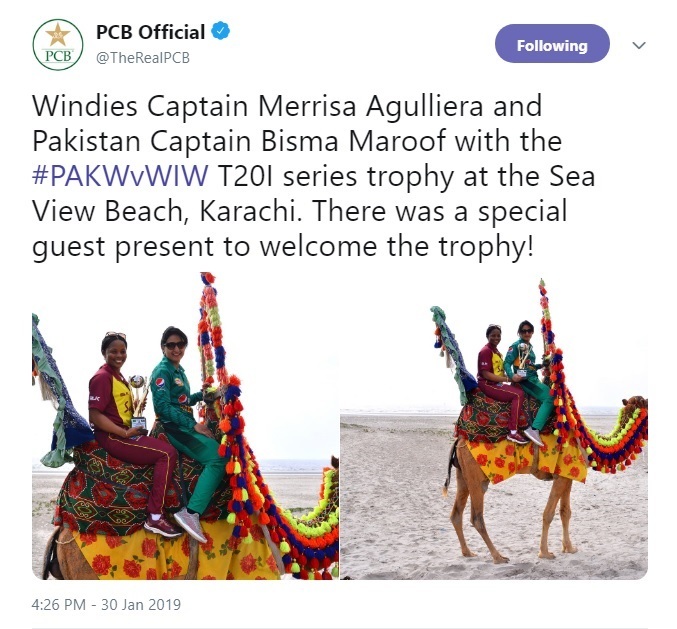 Pakistani women team captain Bisma Maroof and her West Indian counterpart Merrisa Agulliera visited the Sea View Beach on Wednesday. The two took a camel ride with the T20I series trophy. Earlier, West Indies women cricket team arrived in Pakistan to play a three-match T20 series from January 31 to February 3 at Karachi’s Southend Club. The Windies’ return to the country marks the resumption of women’s international cricket in Pakistan since they hosted Bangladesh for two T20Is and two ODIs in September 2015. West Indies last toured Pakistan 15 years ago in March/April 2004 for an ODI series.